It would be easy enough to recount the plot of Peter Stamm’s novel Agnes. But plot doesn’t do justice in expressing why the Swiss author is so enjoyable to read. Coming on the heels of the warm reception of All Days Are Night, Seven Years, and the story collection We’re Flying, Agnes is Stamm’s debut novel, originally published in 1998, now available for the first time in the US. 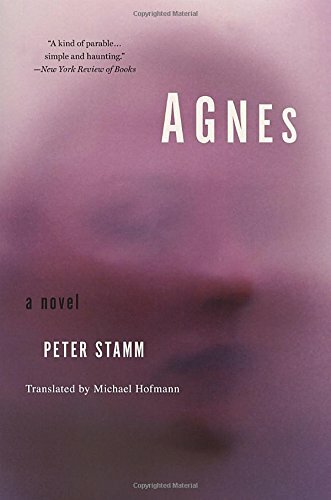 As in all of his books, what’s remarkable about Agnes is Stamm’s deceptively simple way of writing. That is to say, he makes writing seem easy. As if anyone can do it. And we know writing like that is very difficult. More impressively, Stamm is one of those writers who literally get in your head, influencing your inner monologue, causing you to narrate your daily life as if you were the narrator of one of his stories. A disturbing love story, Agnes is about the interplay between art and life. Art is usually said to imitate life, but in this case it’s life that is determined by art. The narrator is an unnamed European writer is staying in Chicago to research a book about American luxury trains. He’s previously published books on cigars and the history of the bicycle, but is not particularly proud of having written nonfiction. At the public library he meets Agnes. She’s described as unremarkable looking, but with her “unusual, expressive eyes” she distracts him from work and takes up his thoughts. Over a cigarette he learns she’s a 25-year-old PhD student in physics who plays the cello and likes painting and poetry. Things move swiftly in Stamm stories; they begin by getting coffee together, and soon she’s moving in. When she finds out the narrator has given up fiction, she asks him to write a story about their relationship, so she can know what he thinks of her. He starts writing, and as his story progresses it leads their real relationship. What Agnes wears in the story she wears in real life. What he has her say in the story she says to him after reading it. Art and life are created together. But then something happens in real life that doesn’t happen in the story: Agnes becomes pregnant. When she asks the narrator if he wants the baby, he answers, “I don’t want a baby. What would I want a baby for?” It’s lines like these that make it a joy to read Peter Stamm. His dark yet honest way of looking at the world. Because really, what would anyone want a baby for? No, Stamm’s stories are never happy. But as his narrator says, “happiness doesn’t make for interesting stories. Someone once said that happiness writes white. It’s fleeting and transparent, like smoke or fog. Do you know any painter who could paint smoke?” Following this lead, he and Agnes go to the Art Institute of Chicago to see if they can find a painting of smoke or a painting of happy people. They don’t, but Seurat’s A Sunday Afternoon on the Island of La Grande Jatte comes close. It’s a sunny day in the painting, with people promenading along the riverbank and relaxing on a meadow. Looking from far away, they could be happy. Here’s another example of life imitating art, but it’s an intriguing line of thought that can’t be grasped through an explanation of what Agnes is “about.” Because Stamm’s writing is about more than what it’s about. When his narrator and Agnes separate for a while, he meets another woman named Louise who tells him, “You don’t love me, and I don’t love you. But what’s it matter . . . so long as we’re having fun.” Even though we’d like life to be otherwise, this is often how life is. What’s it matter, so long as we’re not alone? But we’re always alone. “We imagine we all share the same world,” the narrator tells Agnes on Christmas Eve. “But each of us is in a mine or quarry of his own, just chipping away at his own life, doesn’t look left or right, and can’t even turn back because of the rubble he leaves behind him.” Like this, Stamm expresses truths we’d rather not admit to ourselves. The slim novel begins and ends with a video the narrator filmed when he and Agnes visited a national park not far from Chicago. There they hike in an area that was once inhabited but had been abandoned during the Depression. “Within a few years, Nature reclaimed everything,” a ranger tells the couple. “Civilization is only a thin veneer, and unless you look after it and keep it up, it cracks.” Civilization cracks. That’s an unsettling observation, and passages like this are partly why Stamm’s writing is delightfully haunting. Through such powerful sentences, his writing is able to access the very reason why we love reading. “I’m always sad, each time I finish a book,” Agnes says. “It feels to me as though I’ve become the character in it, and the character’s life ends when the book does.” A poignant line that also encapsulates the idea of the novel itself. Yes, yes, this is why we read book after book. Because good books make us feel light and free, reborn. It’s a highly addictive sensation. One perhaps to our detriment. “I sometimes wonder whether writers really know what they’re doing to us readers,” Agnes says. Sometimes I wonder, too. Randy Rosenthal has interviewed many authors and written hundreds of book reviews for Tweed’s and The Coffin Factory, as well as the Paris Review Daily, Bookforum, the Daily Beast, and the Brooklyn Rail.